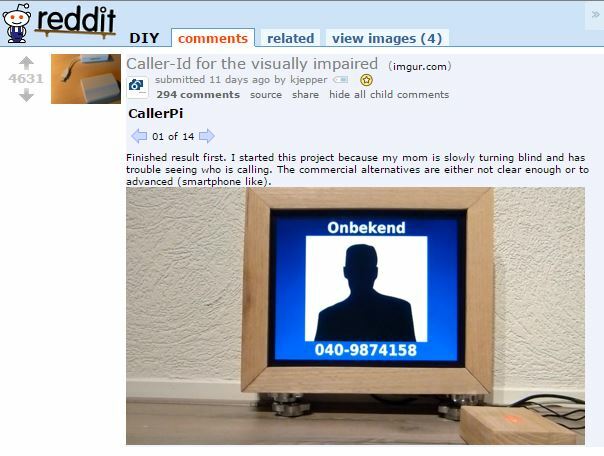 Last week I came across an interesting post on Reddit that outlined a DIY caller ID for the visually impaired. The caller ID system was created by a Reddit user for their mother because commercial alternatives did not adequately fit the needs of the mother. This is often also the case for clients working with PPAT – there are commercial solutions to many challenges caused by disabilities, but they often do not fit the unique situation of the individual user precisely. The post struck me because I realized that there are likely tens of thousands of individuals with disabilities, relatives, and friends who have taken on the development of simple, custom assistive technologies. Additionally, with the ubiquity of cheap electronic devices like smartphones, tablet computers, and accessible microcontrollers like Arduinos, countless assistive technologies can be developed quickly and cheaply by anybody with a bit of programming knowledge. Not everyone has the programming background necessary, though. The availability of electronics has led to a massive network of hobbyists who do have programming experience (including myself and many of my friends) who create often mundane and largely useless devices just for fun and to satisfy curiosity. Many of these hobbyists take the time to thoroughly document their efforts on online forums like Instructables. I’m curious if a system, probably a website, could be an effective way of broadcasting ideas for simple assistive technologies from those who need them to a broad audience of hobbyists who are looking for an interesting project to spend a weekend working on. Thought would need to be put into the logistics of such a website: would it just be a place where hobbyists could post code and instructions for making an assistive technology, or would it go further in pairing individuals with hobbyists. A forum of this kind serves two purposes. First, it disseminates the types of assistive technologies that have the potential to drastically improve an individual’s quality of life. Second, it serves as a repository for assistive technologies that have already been developed, reducing the duplication of work to solve the same or similar problems. This entry was posted on Friday, October 16th, 2015 at 8:47 pm and is filed under Uncategorized. You can follow any responses to this entry through the RSS 2.0 feed. You can leave a response, or trackback from your own site. The assistive technology channel on instructables is pretty good and has a pretty wide range of devices. When I took the course, one of the deliverables was to create an instructables-like page for our project outlining how the device could be made by another individual. We included parts lists, plans, etc. We used a website specifically for assistive technology which I can’t seem to find anymore.. I will keep looking and get back to you!